The central figure throughout the many line-ups of Atomic Rooster was Vince Crane, who'd previously played for The Crazy World Of Arthur Brown. Drummer, Carl Palmer, (ex-Chris Farlowe's Thunderbirds) had previously played with Crane on The Crazy World's US tour. 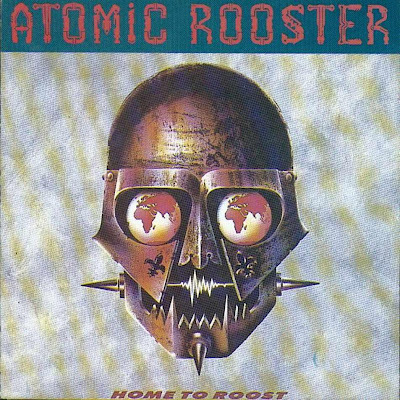 They seem to have taken their name from an album by the American group Rhinoceros and, having quickly established themselves on the club and college circuit, issued a debut album Atomic Rooster in 1970, which was well received and sold enough copies to make the Top 50. A couple of tracks were also put out on a 45 but these failed to make much impact. Their promising start was rapidly arrested in 1970 when Nick Graham departed for Skin Alley, being replaced by John Cann (ex-Andromeda). In June, Carl Palmer also left, to became one third of Emerson, Lake and Palmer. He was replaced briefly by Rick Parnell (ex-Horse). In the Autumn of 1970 Vince Crane put brought in former Farm drummer Paul Hammond to replace Parnell. This line-up played a much heavier brand of rock which proved popular with the punters. The Death Walks Behind You album made the UK Top 20 and they also enjoyed two Top 20 UK hit singles with Tomorrow Night and their best known song Devil's Answer, which peaked at No 4. In 1971 they signed to Pegasus Records and with the addition of vocalist Pete French (ex-Big Bertha/Leaf Hound) they recorded the In Hearing Of album, which many consider to be their finest. Once again their progress was halted when John Cann and Paul Hammond left in September 1971 to form Bullet. Parnell rejoined with Steve Bolton (ex-Wide Open) and vocalist Paul French departed in February 1972 to the U.S. band Cactus. The next line-up Crane pieced together (E) raised a few eyebrows by virtue of the inclusion of R&B singer Chris Farlowe (ex-Jon Hiseman's Colosseum). Supplemented by two girl backing vocalists Liza Strike and Doris Troy they changed from their previous hard rock format to a sort of soul funk recording a couple of albums and singles for Dawn. Earlier copies of Made In England came in a denim cover and, along with Nice 'n' Greasy (on which guitarist John Mandella also played), these are their rarest items. The Save Me 45 was also a non-album cut at the time. The sales of the two Dawn albums were disastrous and taking the view that the band's fortunes were in irreversible decline Crane disbanded them in 1973. The inevitable compilations appeared over subsequent years of which the Home To Roost double set was the most worthwhile. During this period, Bolton left in Dec '72 to Headstone, being replaced by Mandella (aka Johnny Goodsall ex-Alan Bown). Farlowe left in May '73 to tour with a pickup band as Chris Farlowe and The Thunderbirds to promote an album. For live appearances, they were joined by sax players Brian Juniper and Tony Super-Smooth (both ex-Grand Stamp). Parnell then joined Al Matthews' Last Word and Mandella/Goodsall joined Brand X. Having done some further work with Arthur Brown in the interim Crane reformed the band in 1979 reuniting with John Cann and drummer Preston Hayman. They recorded an album and a couple of singles for EMI and then, with Hayman having been replaced by previous member Paul Hammond, a couple of singles for Polydor and an album for Towerbell. After the latter made no impact at all Vince Crane decided to bring the Atomic Rooster story to an end for good. He was briefly a member of Dexy's Midnight Runners. Sadly Vincent Crane committed suicide on Feb. 14 1989. Atomic Rooster remain an important thread in the tapestry of early seventies progressive rock.